George & Jeanne Ehmer started restoring this former Carnegie library building in 2005. They have transformed it into an attration boutique filled to the brim with an imaginative mix of ever changing merchandise. The Ehmers invite you to free yourself from the ordinary. Come in, linger, enjoy, and relax as you browse through the nooks and crannies of unique gifts & home decor that are artfully arranged in themed sections such as western, wine, lodge, country, and more. 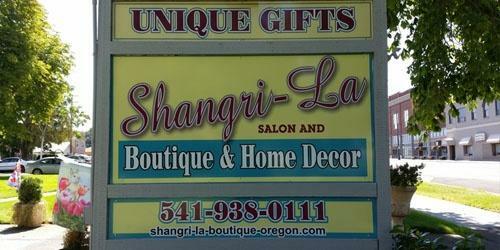 Shangri-la is the perfect destination to shop for any season, any reason as you will find inventory plentiful & turns over quick allowing for more exciting items. It is definitely a place to discover. And remember... no sales tax in Oregon.